The Seaside Aquarium is the oldest privately owned aquarium on the west coast. A variety of festivities will help the aquarium mark its 70th year, starting with a celebration Memorial Day weekend. On Friday May 25, the Aquarium will offer original admission prices: 15 cents for adults and 10 cents for children. Ask the aquarium staff about other upcoming events. The aquarium originally opened as Viggers� Seaside Baths and Natatorium, a salt-water swimming pool, in 1924. There was a fountain in the shallow end large enough for multiple people to sit or stand on. Boilers kept water temperatures between 70 and 80 degrees for the main pool that held 160,000 gallons of salt water. A smaller kiddie pool existed in the front. At that time there were two natatoriums in Seaside, the other at the Turnaround where TrendWest now stands. During the depression Viggers� Natatorium closed. 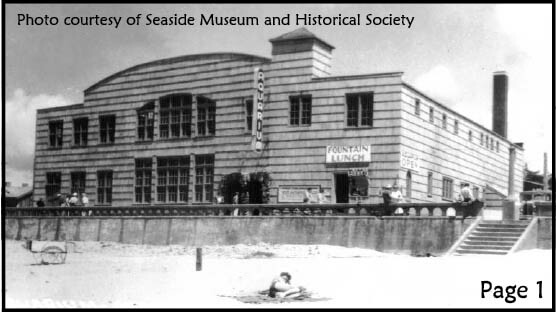 On Memorial Day weekend of 1937, the Seaside Aquarium opened in a refurbished building. The floor of the exhibit area rested on top of the old pool, with the shallow end at the west side, sloping down to a deep end that housed the aquarium�s filters. The octaganal tank in the center of the main room was all that remained of the fountain. Opening the Seaside Aquarium was a joint venture of George P. Smith, Harry T. Kent, and Frederick J. Newman, led by H.L. Collins. Collins had previously opened the Depoe Bay Aquarium. First noteworthy displays included an anemone tank, a large tidepool display, and an octopus, but seals soon became the stars of the show. Addition of Seals In the 1940�s baby seals left on the beach were mistakenly believed abandoned. The aquarium took in these waifs left to fend for themselves, a practice that was halted with increased knowledge of seal behavior and the implementation of the Marine Mammal Protection Act. 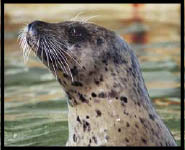 Now, the aquarium�s seals are bred in captivity, as they have been for fifty-five years. 1924 Viggers� Seaside Baths and Natatorium opens. 1926 In the off season, natatorium doubles as a holding tank for an experiment to raise silver salmon in salt water. Mid 1940s Aquarium acquires seals. 1952 Flipper the Seal conceives and gives birth to Flapper at the aquarium. First instance of a seal being conceived and born in captivity. 1967 Beluga whale held at the aquarium. 1978 Last seal taken in from the wild. Jenny becomes part of the aquarium family as a favor to the National Marine Fisheries Service. 1994 Victor the Lobster kidnapped. 1995 Interpretive Center opens in aquarium. 1995 Seaside Aquarium becomes north coast responder for the Marine Mammal Stranding Network. 1996 Aquarium helps launch Seaside�s Watershed Estuary Beach Discovery Program. 1998 Aquarium adds gray whale skeleton to displays.